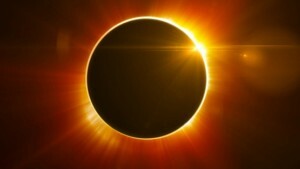 WILLEMSTAD - According to the Meteorological Department, a total solar eclipse will take place on Monday, August 21, and will be visible from a narrow path spanning part of the Pacific Ocean, all across the United States of America across part of the Atlantic Ocean, weather permitting. Curaçao and the rest of the Eastern Caribbean will experience a partial eclipse on Monday afternoon starting at 2.18pm and ends at 4.49pm. The eclipse will reach its peak at 3.38pm. A partial solar eclipse is when the moon comes between the sun and earth, but the moon only partially covers the sun's disk. The moon casts only the outer part of its shadow, the penumbra, on earth. It looks like the moon has taken a bite out of the sun. The Ministry of Public Health, Social Development and Labour, is issuing the following advisory with respect to the partial solar eclipse that will take place on August 21. People should protect their eyes if they are planning to view the solar eclipse. Do not view the eclipse without the proper certified eyeglasses. Do not look directly at the sun, before, during or after the eclipse without any protective eyewear. Looking at the sun with your naked eyes is highly dangerous and can damage your vision and cause permanent blindness. Looking directly at the sun without the correct eye protection, even for a short time, can cause permanent damage to your retinas, a light-sensitive part of the eye that transmits what you see to your brain. Damage can occur without pain, and can take a few hours or even a few days after viewing the eclipse to have symptoms of damage, which include not being able to see colors as well and loss of central vision, with only side vision remaining. If you notice any symptoms after viewing the solar eclipse, seek immediate help from your eye care professional. The only way to look directly at the sun when it's not eclipsed or is only partly eclipsed is with a special solar filter, such as eclipse glasses or a handheld solar viewer. Make sure your eclipse glasses are certifiably safe. Watching the eclipse with glasses that haven't met certain qualification can lead to eye damage. Goggles, homemade filters, or sunglasses, even very dark ones, will not protect your eyes. Also, always avoid looking at the sun through an unfiltered camera, smartphone, telescope, or any other optical device. You'll need to add a certified solar filter to these devices to safely look at the sun. Even if your eclipse glasses meet the safety standards, don't use them if: The lenses are scratched; The lenses are wrinkled; They are older than three years. You can also make your own simple and inexpensive pinhole projector to safely view the eclipse, and never look at the sun through the pinhole. Do not look at the eclipse without special protective eyewear, and adjust outdoor practices accordingly as darkness could be a factor during the eclipse. Schools, are advised to plan accordingly for play and practice times.